Mining and quarrying together with oil & gas prospection complete the extractive industries landscape. Minerals have myriad uses in several key sectors of the world economy. Specifically in the oil & gas world, minerals used in the drilling process (e.g. - barytes, bentonites and frac sands) are key components of the hydrocarbon extraction processes. Within this global setting, exploration, logistics and allied businesses are frequently impacted by constantly evolving commercial, legal, health and safety and cross-jurisdictional due diligence scenarios. Furthermore, professionals in the business as well as corporate project sponsors also need to keep abreast of technical and scientific matters ahead of a project feasibility study. The book – Minerals and Mining: A Practical Global Guide – not only seeks to address an information gap in sector but also hopes to mitigate the information overload in this day and age. 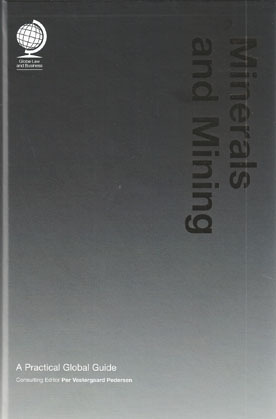 This succinct handy guide of just under 300 pages dwells on key legal and commercial concerns of the minerals and mining world. Various aspects of the subject at hand are examined by industry professionals via 19 detailed chapters. Each chapter has been authored by jurisdictional experts ranging from Argentina to Russia who work for some of the most recognisable brands in the legal and advisory business – including, but not limited to Allen & Overy, Norton Rose, SNR Denton and KPMG. Topics include regulations, agreements, tariffs on minerals and mining; legal processes concerning licences, concessions, production sharing and mining development agreements; financing; mining management and operating facets and last but not the least - the sale and purchase of mining assets. Additionally, mineral trading, environmental protection, social responsibility, accounting and taxation in various jurisdictions have also been examined. The treatment of Latin American nations – Argentina, Brazil, Chile, Mexico and Peru – stands out for its veracity. However, it is the detailed chapters on emerging scenarios in Africa that sealed the deal for the Oilholic. As with works of this nature, consulting editor Per Vestergaard Pedersen of Lett Law Firm has done a commendable job of knitting this book of experts together. He has also authored an informative chapter on Greenland; a jurisdiction where mining activities have grown exponentially between 2002 and 2012. On the whole, as expected the book is aimed at professionals with a mid-tier and upwards knowledge of the sector. The Oilholic believes it would make a handy and informative reference guide for legal practitioners and financiers. Executives at advisory firms, banks, engineering consultants and mining, shale, oilfield drilling project EPC contractors would appreciate it as well.